That’s the legendary inscription on the James Farley Post Office in New York City. But lately we’ve been thinking of carving those same words into the wall of our own fabrication facility, because our guys have been warriors when it comes to installing signage under difficult or even adverse conditions for our customers. 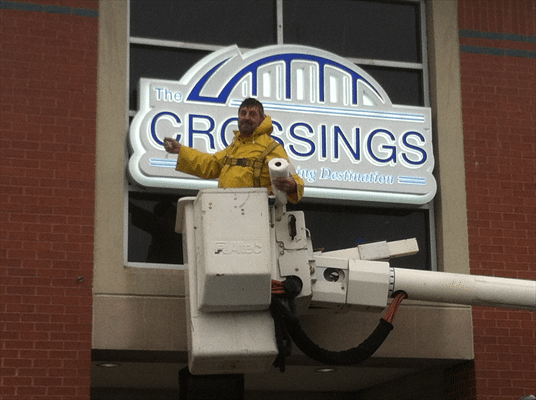 For example, the photo accompanying this post shows Glenn Stetzler up in the cherry picker in the middle of some exterior installation work at Crossings. It’s a shopping plaza managed by KeyPoint Partners, who asked us to do extensive work, including building signage, main entrance identity signage, and exterior way-finding signage. Weather reports had been calling for severe weather for the past few days … and that day was no different. The highest chance of severe weather was going to be in the afternoon, so the guys hit the road extra early, worked through some of the heaviest downpours we’ve seen, and were able to finish up by 11am. Wind and rain were right on the limits, but the guys just pulled their slickers tighter and kept at it. That was the culmination of some 3-4 weeks of hard work, from the moment the project hit the fabrication floor to the scheduled installation. I can’t give our shop guys enough credit for getting every element built on schedule, and I can’t give enough praise to our installers for getting all the signs in place, right on time. They’re the backbone of the company-wide team that makes our reputation as good as it is. This signage project has been about 2 years in the making, and it’s not done yet. It has gone through many revisions, and even required a series of meetings with the Planning and Zoning Boards culminating in a night-meeting/Hearing Process that included reviewing the details of sign location, size, and illumination, even to the point of demonstrating some illumination and digital sign components for the Boards’ approval. We’ll be fabricating and installing those in Phase 2. Stay tuned for an update when that work comes around. Meanwhile, if you’ve got a tough signage challenge coming up, please give us a call at 978-401-4648.